Overall size (paper): 28" x 17"
Image size (paper): 25" x 12"
Canvas image size: 30" x 14"
During their tenure in China, the American Volunteer Group (A.V.G. 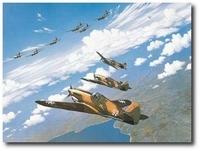 ), a.k.a.�The Flying Tigers", operated from various airfields in southern China. One of these air bases was in Wujiaba, China, where they were stationed from early 1942 to July, 1942. 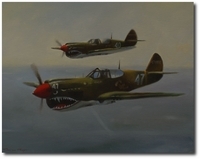 This image depicts two well-known Third Squadron �Hell's Angels� pilots, Robert. �R.T.� Smith and Charles �Chuck� Older taking off from Wujiaba in the early morning for a raid on a Japanese airfield in June 1942. It is warm and humid as morning fog and mist lifts creating a hazy view of the mountains in the distance.